Finca Churupampa is an independent exporter and social business from Chirinos, Peru. 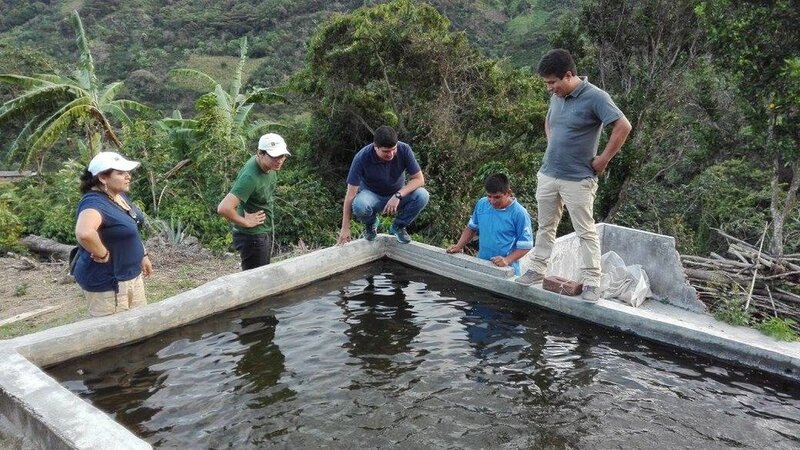 When we came across Churupampa through Sara's network, we saw the smallholder development model that we are promoting worldwide, but fast-forwarded several years. The Tocto family's achievement is a national example of how entrepreneurship, respect for local farming traditions, circular thinking and direct roaster relations can completely change rural livelihoods. Since 2011, the coffee farming community in the town Chirinos has done away with the subsistence coffee farming mentality and steadily created a strong, quality focused brand: their innovative processing and independent quality control lab ensure that they can create beautiful coffees that are sought after yearly by the specialty market - up to now mainly in the US. In 2017 This Side Up connected to Churupampa, and we immediately knew we wanted to welcome this group of farmers into our "family" and help them continue their path of quality innovation and expansion to more people in the region. As a first import, we sought to identify lots that represent the breadth that this origin can offer. The Churupampa lot is surprisingly fruity for a Peru with notes of apricot, orange, sugar and custard, whereas the Cordillera Nadina is deep sweet with notes of molasses, sugar cane, lime and cocoa nibs. A value chain like this is the pinnacle of independence for a smallholder coffee farm. Churupampa simply hires the services of a dry mill and is fully in charge of the export process, offering their coffee not from the farm gate, but from the port (FOB Paita), making our lives as importers very easy. Churupampa is not just a farm, it's a social business model which the Tocto family aims to expand, last year to 30 neighbouring farms in their town of Chirinos. Some of the upgrades include better processing facilities, plant renovation schemes with the introduction of new varieties, new drying techniques with plastic covered raised beds to secure stable and uniform drying despite seasonal rainfalls. In 2018, the quality control team cupped around 4,000 samples. Not one lot goes uncupped! Organic and Fair Trade Certified. 2017: farmers who produced our two lots installed small drying station (structure + raised beds) on their farm to dry their parchment and extend the drying from 6/7 days on patio to about 25 days of slow drying, which considerably extends the shelf life of the coffee. 2018: Exchanged knowledge of Churupampa’s superbly circular coffee system into the TSU network at the Producer Crossover in Amsterdam in June. 2019: Imported the first 83+ coffee from Churupampa - but retaining a relatively similar premium, an experiment to appeal to roasters on a budget. Fully washed and double fermented - using a hand pulper, coffees are pulped and fermented in tiled tanks for about 12-24 hrs depending on weather. They are then washed and fermented again for the same amount of time. Coffees are then washed again and graded in channels. Parchment is dried on raised beds covered in plastic. This drying technique is absolutely vital to counter effect the heavy rainfall and high humidity that characterises harvest months in Chirinos. The average price you pay for this coffee p/kg. This Side Up pays US$ 6,05 straight to the Tocto family. Churupampa pays their partner farmers 60% of this price directly, then 30% at the end of the season when the premiums from buyers are collected. The remaining 10% covers Churupampa's operating costs. €4,55 is the total price Churupampa pays farmers in two rounds. €0,78 represents Churupampa's operating costs . Of this, €0,27 is an extra premium that we decided to pay so Churupampa can expand its already impressive sustainability program. Total shipping costs from Paita to Rotterdam + local clearance and warehousing. This Side Up compensation for spending time and resources importing this coffee. Our work includes building relationships with shipping and warehousing partners, managing export, import and shipping bureaucracy, Q grading, sampling and jointly promoting this coffee with Churupampa. Average financing cost (5% of the sales price) we have to pay lenders - simply because we don’t have the money in the bank to buy such large amounts of coffee all at once. This ensures immediate payment to Churupampa when the coffee leaves the port. These two coffees shine very brightly with a quick roast that highlights its fruit notes, so we prefer our TSU Washed 2 profile. The typical Peruvian chocolate undertones still develop well, as does its smooth body. Cut the roast short if DTR exceeds 25%. You may use these images freely to promote Churupampa among your customers. Lenin Tocto Minga is the manager of Finca Churupampa, shoot him an email to find out more about their coffee and impressive sustainability measures. Our communication is solely in Spanish. Known for the Andes mountain range, and for its incredible number of microclimates (28!) , Peru is probably one of the best suited countries in the Americas to grow specialty coffee. Coffee was introduced as early as in 1700s, but only at the beginning of the last century the country started to play a prominent role in global coffee exports. This surge in export was consequent to a large loan repayment scheme which handed Britain over 2 million hectares of land that was quickly converted into British owned coffee plantations. Fast forward to more recent times, the old coffee plantations have been divided and re-distributed among local population, giving rise to a small, fragmented and yet vibrant coffee sector. For decades, the country focused in strengthening the sector and organizing farmers in small holder coffee cooperatives to increase production, with a major focus in fair trade and organic production. This effort led Peru rise the ranks of leading export countries – and leader in organic production. However, it also posed limits to creating the adequate infrastructure to produce high end specialty coffees. 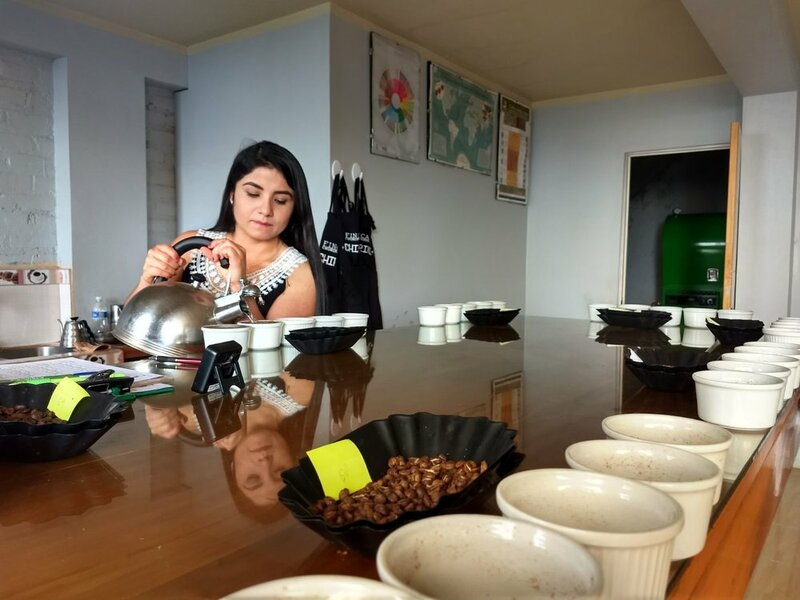 In the 2000s, while neighbouring countries started to pay attention to the specialty coffee market in search for premium and added value, Peru struggled to strike its own balance between ‘volume’ and ‘quality’. Luckily today this is no longer the case, and more producer groups are investing in quality. 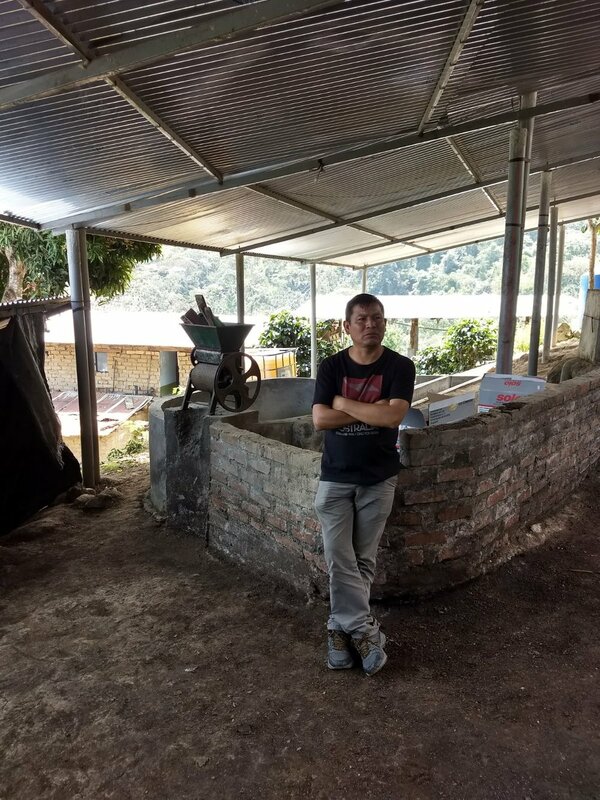 The Tocto family took it upon themselves to radically change the way they were growing coffee by establishing a new coffee farming model based on principles sustainability and quality. Their farm, Finca Churupampa (a Quechua word, ch’uru means "snail" and pampa means "plains") quickly became a shiny example of how to integrate agronomic best practices, focused on healthy plants and soil nutrition, and enhancing quality, focused on planting the right varieties and investing in proper processing and drying infrastructure. Quality control is also not new to them. Eber – one of the founders of Finca Churupampa – was one of the first Peruvian cuppers to become Q certified over ten years ago. Lot separation and quality evaluation is routine work at Finca Churupampa. Our first two lots from the Churupampa farm landed in February, 2018. We are extremely happy with how these two lots are cupping: the two of them together represent the true best of what we feel Peru has to offer: Bright, clean (clearly very well processed) dark chocolate notes, full, creamy body, sweet and blackberry acidity. In February, Sara went to Peru again and met with the two main producers of both lots. They are both planning to invest in composting and microorganism this year, and our premium will help towards that. We are starting to plan for next harvest: Churupampa will work on selected lots and even a direct farmer program with This Side Up.